My love affair with Oskia began over two years ago with the release of their now cult product – the Renaissance Cleansing Gel. Since then, I have tried and loved multiple products from the beautiful line and in this post I am finally going to do a review of the cleanser that started it all, as well as the Eye Wonder Serum and the soon to be released Renaissance 360 Supreme Cream. One of the things I love most about Oskia is their commitment to scientifically driven, plant based nutritional skincare. The founder, Georgie Cleeve, understood the need for both nature and science and combined both to create a thoughtful range of products that nurture the skin and actually work. Oskia are focused on healthy skin and all of their products are packed with vitamins, minerals, omegas and bio-actives to help their customers achieve the healthiest skin from the inside and out. There are no extravagant, unrealistic claims with Oskia and they fully acknowledge and advocate that healthy skin must be cultivated from within, but they also understand that what we put on our skin can really make a difference and their products definitely do that. As I said before, this is the product that made me fall in love with Oskia. Before I started using this cleanser, I pretty much hated cleansing. Everything I had previously used didn’t really work for my combination skin and left me either extremely dry or congested. This product helped me understand and love the ritual of cleansing and is still one of my most loved and most used cleansers. The Renaissance Cleansing Gel was the first of the gel-balm hybrids and is still the best one out there. The texture is light and easy to work with and melts into an oil before becoming a milk when water is added. It has a soft, natural floral scent of Rose and Camomile, that is relaxing without being overpowering. It is a versatile cleanser that can be used as a first and/or second evening cleanse and/or as a morning cleanse. If you are using it as a first cleanse to remove makeup (it is safe to use around the eyes) then you should use a full pump. If you are using it for a second or morning cleanse then I recommend using no more than half a pump to avoid the feeling of residue on your face. It is excellent at removing eye makeup and when used as a double cleanse, leaves no traces behind. It comes in a pump bottle (love) which prevents any contamination, makes it hygienic to use and travel friendly. The key ingredients in this are vitamins A, C and E, fermented pumpkin enzymes, Omega 6 and MSM. They work together to nourish and cleanse the skin without stripping it or causing any irritation. The fermented pumpkin enzymes decongests and removes dead skin cells, the Starflower Oil (Omega 6) softens, hydrates and restores balance and MSM detoxifies, calms and soothes. MSM (contained in the brand’s patent pending MSM repair and regeneration complex) is the star ingredient in every single one of Oskia’s products and is so important for beautiful, healthy skin. I highly recommend you reading more about it here because it’s one of my favourite ingredients. Because of the excellent ingredients in this cleanser, I love to use it as mask when my skin is feeling dry or irritated as it’s so hydrating and soothing. Either while in the bath or just when I am brushing my teeth, I leave it on for a few minutes to let it work some magic before I remove it. When I do this, my skin is always so soft, smooth and calm afterwards. I would definitely recommend this for all skin types but especially those with combination skin – it has never caused a break out or left my skin feeling tight/parched. It’s a balancing cleanser that will purify your skin without drying it out and give you hydration without causing any congestion. Those with oily skin will probably need to use a washcloth every time but other than that, this is a lovely product that I think everyone would enjoy using. For years I had struggled to find a great eye cream that would give me results I could actually see (ha-ha) without causing any irritation. My eyes are quite sensitive and lots of products I’ve used in the past (even plant based ones) would cause my eyes to water and feel itchy, so in the end I just gave up. Last autumn I decided to really make an effort to find an eye product I could use and in my sample stash I found this product. I loved it so much that before I had even finished up the sample I purchased a full size bottle. I can count on one hand the number of full size eye products I have owned so you know that’s a big deal. This serum has a light gel-like texture, sinks in quickly and is incredibly soothing and hydrating. It has a very faint floral scent from it’s Rose Water base and is full of excellent ingredients like Niacinamide, MSM, Vitamin P, and Milk Peptides to address fine lines and wrinkles, reduce dark circles and protect against future damage. It contains very little oil, so should not cause any milia but does contain hyaluronic acid, so it will definitely hydrate the under eye area without feeling heavy. You only need a very tiny amount so even though it might seem pricey, it will last for a very long time. I find this eye serum so easy to use and love how refreshing and cooling it feels. It never irritates my eyes and glides over the skin meaning there is no tugging or pulling on the delicate eye area . After I’ve applied it my eyes look more “awake” and it works very well with my concealers – I find they “sit” much better when I’ve got this on. I’ve been using this consistently for about 3 months now and I can definitely see a difference. The skin around my eyes is less dry and doesn’t have that crepe-y feel and my eye area looks brighter and smoother. Ingredients: Aqua (Water), Caprylyl Caprylate/Caprate, Glycerin, Zinc Oxide, Simmondsia Chinesis (Jojoba) Seed Oil, Argania Spinosa (Argan) Kernel Oil, Cetearyl Olivate, Cetearyl Alcohol, Sorbitan Olivate, Inulin Lauryl Carbamate, Dimethyl Sulfone (MSM), Butyrospermum Parkii (Shea) Butter Extract, Helianthus Annuus (Sunflower) Seed Oil Unsaponifiables, Myristyl Myristate, Opuntia Ficus Indica Stem Extract, Sodium Hyaluronate, Lepidium Sativum Sprout Extract, Helianthus Annuus (Sunflower) Seed Oil, Lupinus Albus Seed Extract, Tocopheryl Acetate Bisabolol, Galactoarabinan, Sodium Ascorbyl Phosphate, Retinyl Palmitate, Tocopherol, Arbutin, Glyceryl, Linoleate, Lyceryl Linoenate, Linoleic Acid, Linolenic Acid, Glutathione, Phytic Acid, Cetyl Palmitate, Sorbitan Palmitate, Phenethyl Alcohol, Silica, Benzyl Alcohol, Caprylyl Glycol, Lactic Acid, Sclerotium Gum, Ethylhexylglycerin, Titanium Dioxide, Alcohol, Parfum (natural fragrance), Lecithin, Sorbitol, Xantham Gum, Disodium EDTA, Glyceryl Caprylate, Phenoxyethanol, Geraniol, Citronellol, Linalool. This is one of the newest additions to the Renaissance range and I am so excited about it. I remember writing to Oskia a long time ago asking for a moisturizer with the same ingredients as the cleanser, so I’m ecstatic that it’s finally here. Thanks to Cult Beauty’s amazing Goody Bag, I have been testing this out since November and I love it. As you will know, I am not a fan of moisturizers and never used them until I discovered Odacité’s brilliant Oleosomes Time Release Delivery Crème but this has now taken the top spot. It is such a beautiful product that moisturizes and hydrates the skin as well as targeting fine lines and discoloration to give you a bright and even complexion. This is the type of moisturizer I have been dreaming about. It has a lovely light texture that doesn’t feel heavy and sinks in beautifully leaving the skin soft and silky. It has a delicate natural floral scent that doesn’t linger and it layers perfectly well with other products. Once applied, my face doesn’t look greasy at all and my skin feels velvety smooth – there is no oiliness or excess shine, just glowing, supple skin. It also has an SPF of 8 which provides a fair amount of sun protection, although depending on where you live and the time of year, you may still want to use sunscreen. This product is incredibly balancing and if you have combination skin, this will be perfect for you. As with all Oskia products, this cream is packed with skin loving ingredients that go above and beyond what is found in typical moisturizers. It contains an impressive collection of ingredients like Vitamins A, D, E and F, Omegas, Liposomes, Acids and Bio-Active Plant Extracts. One of the ingredients that I am most excited about is the natural Arbutin (from the Bearberry plant), which is a hydroquinone derivative and will help inhibit melanin production. Along with Glutathione, Vitamin C and Swiss Garden Cress liposomes, these ingredients will work together to reduce pigmentation and help to prevent future discoloration giving you a bright and even skin tone. Other ingredients like Hyaluronic Acid and Opunia Cactus Extract focus on increasing hydration, strengthening the dermis barrier to firm, smooth and calm the skin. This is more than just a moisturizer, it’s a nutrient rich facial treatment that will improve the look and health of your skin. For me, with my combination skin, this moisturizer is exactly what I have always been looking for but never found. My skin is much more balanced when I use it and I think it would work well with all skin types. Hydration and balance are the key to great looking skin and this will give you that and so much more. Whether you are dry or oily, you want to make sure you are using products that create an equilibrium, instead of a back and forth between extremes. If you are oily – try using this after your purifying serum to prevent any dryness and if you are dry – use this in combination with a drop or two of oil for hydration that won’t feel heavy or look greasy. This doesn’t officially launch until February 29th but I can definitely see it becoming one of Oskia’s best selling products. Oskia have so many amazing products and these three are my current favourites that I just had to share with you. I know it’s not easy buying products when you can’t check them out in store or sample them first, so I hope this review will help in that respect. I can’t wait for Oskia to be stocked in the U.S. (come on, Space NK!) and I would absolutely love for them to do a Renaissance sample set/travel kit to make it easier for people to try their products but until then, one of my favourite online sites Naturisimo has samples of five of their products (including the cleanser) that you can purchase for just £1 each so that’s a start. The Oskia site itself is a wealth of information and I love how open and honest they are – listing all the ingredients of every product, providing further information about what the key ones actually do and even giving a description of the smell and feel of each product. I don’t know of any other brand that does this much to inform and educate their customers. 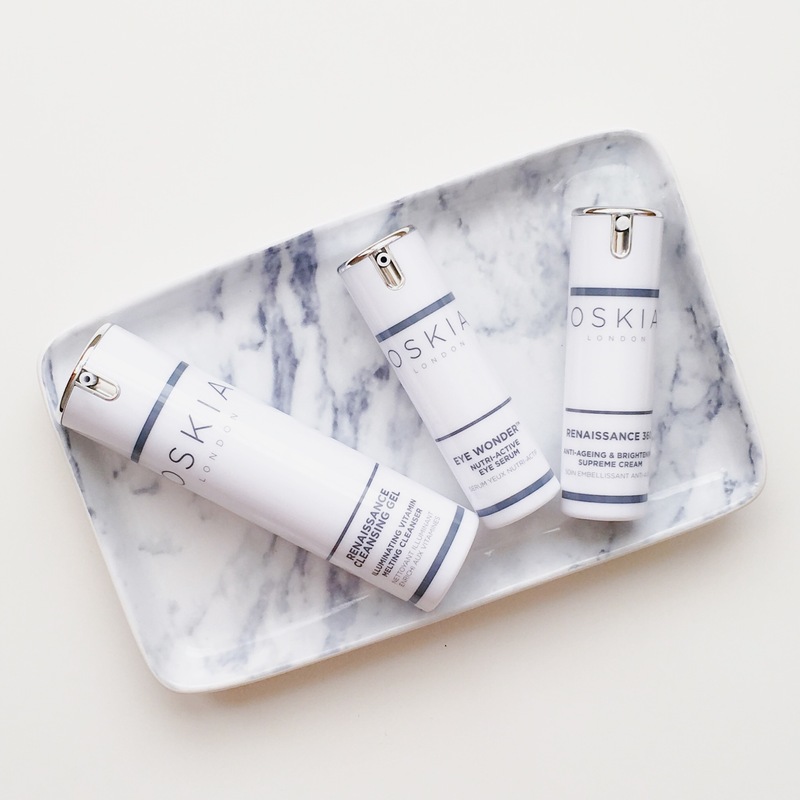 Oskia have created such beautiful, well thought out products and their passion for creating effective nutritional skincare is why they are one of my all time favourite brands and I can’t recommend them enough. Oskia is available from Cult Beauty, Space NK (UK), Naturisimo, Content Beauty and Look Fantastic. All ship internationally. The marble tin is so pretty! Absolutely love the Oskia Renaissance balm and 360 cream. I have had the Eye Wonder a while back when it was packaged differently but I wasn’t the biggest fan. I personally need something heavier and more moisturising for my undereye. I can see what you mean about the Eye Wonder – it is incredibly light and so far that hasn’t been a problem for me but if it is I would layer it with something else. HI, since you recommended bravura I purchased it and it is brilliant! I just started and already have great results. So thank you! Now I want to purchase eye serum or cream and I read this and what you wrote on Odacite which on would you recommend? Hi! So glad you are loving the Bravura peel – it’s so good, isn’t it?! 🙌🏽 Oooh, what’s your skin type? The difference between the Oskia and Odacite moisturizers all depend on what your skin needs. As for eye serums I love this one. I know Odacite have one but I’ve never tried it. everyone is asking me what I’ve done because my skin looks great. my pigmentation is so much better! i live in a very sunny place (Israel) which has sun most of the year even in winter, and i did not use to protect it years ago, now i do. i have a very dry skin with somewhat large pores and it is thin skin. my eye area is very dry and i have a bit dark circles under the eye. Would love to try this cleanser, could I have a code please? Thank you. I’d be interested in trying this – could you please mail me the code? Have been wanting to try Oskia for a while, thanks for all the info. Could I have the code please?